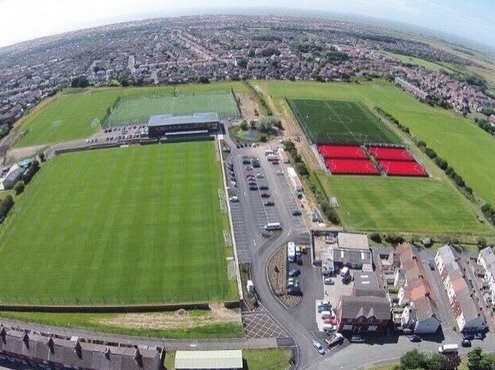 Ten percent of the town's residents regularly attend Fleetwood's home games, a measure of the club's continued success. Lee Williams met up with their new(ish) Head Groundsman, Nick Hyndman, to discover what recent developments have taken place in this remote corner of Lancashire. 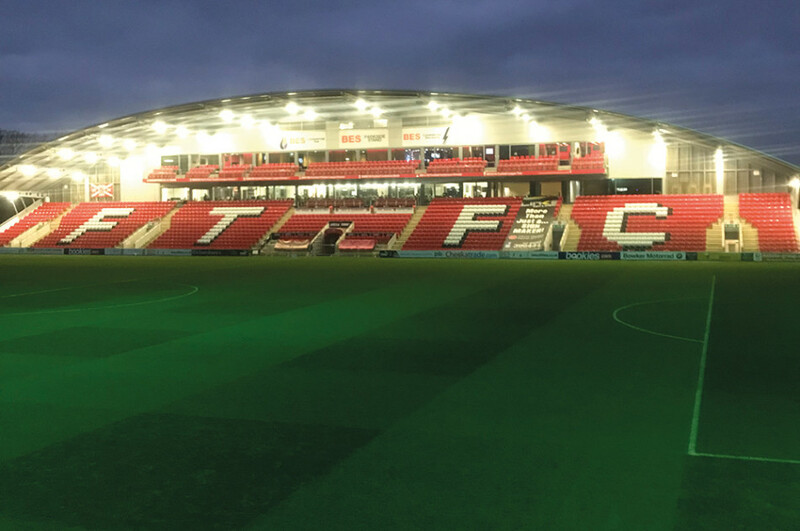 On a very wet and windy day on the Fylde coast, I'm on my way to Fleetwood Town Football Club to look around their new £8m training base at Poolfoot Farm, a state-of-the-art sports and leisure village, in Thornton Cleveleys. 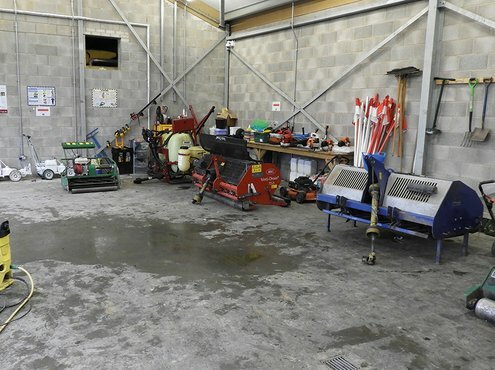 I met up with Head Groundsman Nick Hyndman, behind the training ground at the impressive purpose-built groundsman's shed, which includes an office, brew room, toilets and shower. Before we look around the facility, we decide to sit down in the office and have a brew and a chat hoping the rain will ease off before we go out. Unfortunately, this doesn't happen at any point that day so, once my tour of the training facility was over, myself and Nick were soaked to the bone. 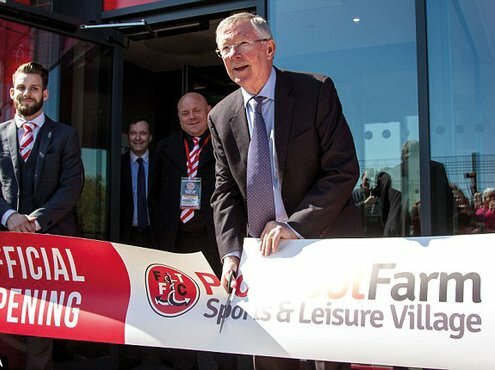 The training ground was officially opened on Wednesday 20th April 2016, by Sir Alex Ferguson. The main building has a fully fitted gym, fitness studio, physiotherapy suite, dedicated classrooms, meeting rooms, a top-quality bar and restaurant, seven changing rooms, offices, reception and club shop. Outside there are Elite pitches One and Two. 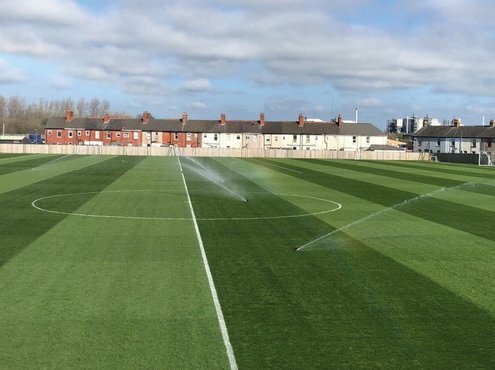 These are a Fibresand construction, with an automated pop-up irrigation system, and are used only by the first team. Pitch Three is a goalkeeper area (drained and sand slit). Pitches Four and Five is one divided eleven-a-side pitch used for under 18s and 23s (drained and sand slit). Pitch Six is a five-a-side grass pitch, mainly used as a warm-up area (drained and sand slit). Pitch Seven is a seven-a-side grass pitch used by the academy (drained and top drained.) 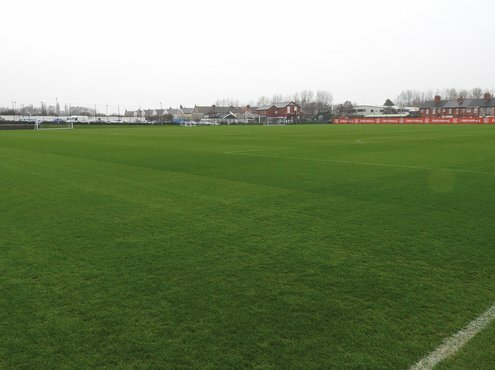 Pitches Eight and Nine are eleven a-side pitches used by the academy (drained, no secondary drainage). 3G pitches - two eleven-a-side and four five-a-side pitches (named Highbury, San Siro, Nou Camp and Bernabeau) complete the pitch line-up. The facility is also open to the community, with hundreds of local children having already enjoyed the use of the 3G pitches, be that local junior clubs, schools or other organisations. The club hopes the new facilities will help persuade talented young local players to develop their skills closer to home. The first team play their home games at Highbury Stadium, which has a capacity of 5327. Nick explains the pitch construction; "It's a natural soil surface with a 100mm 80/20 rootzone. A lot of that has been diluted since it was constructed ten years ago. The pitch is very inconsistent now. We have a lot of localised spots that are now more sand than rootzone, giving us problems with stability. It's on its last legs." To help with stability problems more than shade, Nick has an SGL MU50 lighting rig and a homemade contraption. "Mainly, we move the MU50 up and down the weakest side of the pitch to help keep the grass healthy and to keep the roots growing; the instability is based on the rooting of the pitch with it being rootzone." "One thing I have noticed over the years is that the Highbury doesn't seem to suffer from many matches being called off for frost." I asked Nick why he thinks this is; "We do have frost covers, in case we do get a frost forecast. It may have something to do with being near the sea. It seems to be a few degrees warmer, but I don't know. It's strange; I live in Blackpool, thirty minutes away, and it can be so different there. Just where we are on the coast, we seem to get away with it. We do get frosts, but never like the clubs more inland." Nick has worked for Fleetwood Town for eight years. He started as Deputy Head Groundsman then, eighteen months ago, became Head Groundsman. 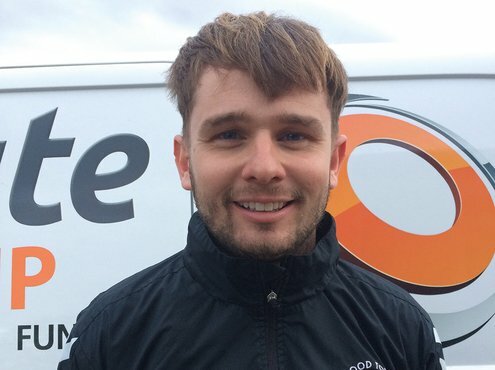 His qualifications include a Foundation Degree Sportsturf Science and Management, National Diploma (Level 3) in Sportsturf, NVQ Level 2 in Landscaping and PA1, PA2 and PA6 spraying certificates. Helping Nick look after the large training facility and the Highbury stadium pitch are Liam Scott-Rattray, Deputy Head Groundsman, whose qualifications include a Foundation Degree Sportsturf Science and Management, Level 3 Extended Diploma in Sportsturf and PA1, PA2 and PA6; Ash Roche, Skilled Groundsman, NVQ Level 2 & 3 in Sportsturf and PA1, PA2 and PA6; Max Knapman, Assistant Groundsman, Level 2 Diploma sports turf; Oliver Vincent, Assistant Groundsman, Level 3 extended diploma and PA1 and Michael Swann, Assistant Groundsman, Level 3 Sub Diploma Sportsturf. It's good to see that the lads have all qualified. I asked Nick if the club support his staff with ongoing training. "I'm trying to get everybody up to a standard. I would eventually like to get all my staff through their spraying certificates. It's a process I'm currently going through with the club." Nick is responsible for the fertiliser and machinery budgets for the Stadium and training ground. These are put through with the accounts manager for approval. On a day to day basis, he works under the chief executive. Walking on the first team Fibresand constructed pitches in early December - in what I can only describe as biblical rain - I was impressed with how healthy the pitches looked and the amount of grass cover for this time of year - at least 90%. Another thing that stood out was that there was no standing water with the amount of rain that was falling. Nick explains; "When it comes to cutting heights and maintenance, we try and keep it pretty similar to the Highbury pitch. I know they are different constructions, but we like to keep it as similar as possible. In summer, we will cut at 23mm; in winter, we will try and get as close to 30mm as possible without upsetting the manager. It's just about trying to find that balance where it's still playable but, at the same time, doing what we can to protect the pitches." Verti-draining is carried out every 6-8 weeks at a depth of around 8 inches and they will verti-cut when required. Nick tells me that, if budgets will stretch into March, he likes to overseed with Johnsons 4turf grass seed, again emulating what they do at the Stadium. Nick explains that maintenance of the surrounding soil pitches is pretty similar to what they do with the Fibresand pitches. "We will cut at 25mm in summer, rising to 30mm in winter. I like to swap between the Verti-drain and Shockwave at least once a month and we will verti-cut if we get the chance. The 3G pitches we brush once a week." Nick tells me he is lucky to have a good fleet of machinery to enable him and his team to undertake all their own maintenance throughout the season. "I'm given a machinery budget which can vary each year, then it's up to myself to assess what we need. I want to invest in a SISIS Litamina next to help with clean-up after training, as I don't feel we get the chance to do this enough." Nick mainly sources his machinery from Campey Turf Care or Cheshire Turf Machinery. They carry out the servicing on the machines, and also use a local mechanic for the smaller jobs. The machines are utilised between both sites. Nick likes to have regular soil samples taken every six months on both the Highbury pitch and Fibresand pitches. "Once the results come back, we will base our fertiliser plan on that, we will also assess how the pitches are performing throughout the year and adjust accordingly." "On the Highbury pitch in June, we used Sierrablen plus Renovator and Greenmaster Zero Phosphate. 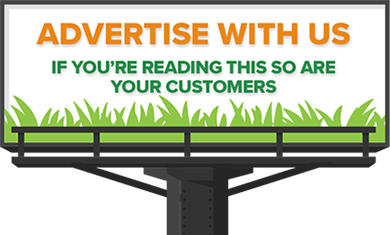 In July, Greenmaster Spring/Summer, Primo Maxx, Seamax, Step Hi Mag and Pro Turf 20:0:7. In August, Sierrablen mini 0:0:37, Seamax and Stress Control 15:0:28. In September, Proturf 15:5:15, Seamax and step Hi-mag. In October, Anti-stress, Seamax and Proturf 15:5:20 and, in November, Proturf 15:5:20." 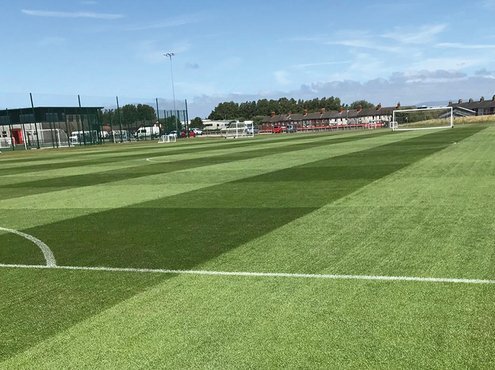 "On the Fibresand pitches we have used Greenmaster Renovator and Zero Phosphate, Step Hi Mag, Sierrablen Active and Pro Turf 20-0-7 and Pro Turf 20-0-7 stress control. 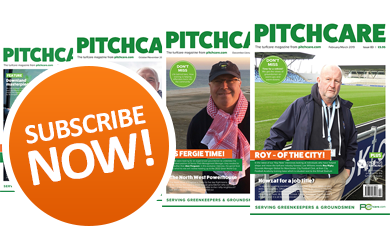 We do fertilise the soil-based pitches, but this is on an as and when necessary basis as we don't have the same fertiliser budget for those pitches." Alongside his fertiliser programme, Nick likes to be pro-active rather than reactive when it comes to disease management of the Highbury pitch. "We suffer now and again with leaf spot, but we do have good airflow, so it's not too bad to be fair. I put the fungicides on for prevention with it being the stadium; it takes away that risk factor, if you will." "At the training ground, it is rare for us to use a fungicide, due to cost, we tend to let it grow out if we get a dose of leaf spot." As well as the club giving the local community access to their training ground facilities, Nick and his team help with local community projects throughout the year, "One project we have been doing is at a local park. 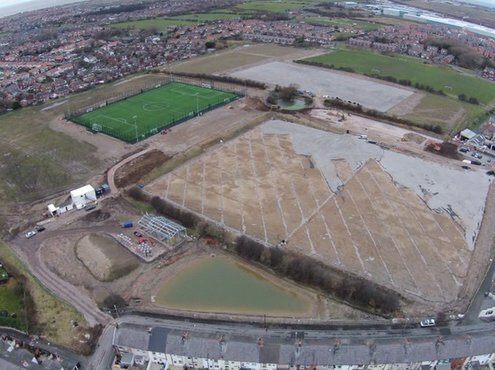 The playing fields have just been drained, so we have been helping them grow it back in, and now we will help it get through the winter months." Nick seems to be well supported by the club, and they understand his needs when it comes to the pitches. I asked him if he ever feels undervalued? "I think groundsman are getting more recognition as a professional sort of job, although we will always be seen as just grass cutters. 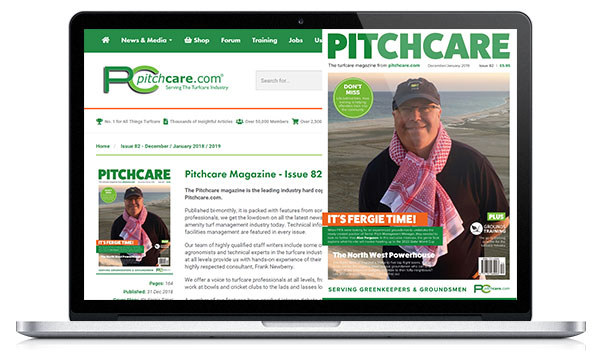 People are realising there is a lot more science that goes into keeping the pitches playable and healthy. But I do feel, 100%, that we are undervalued. We never get many thanks or a pat on the back when the pitches are good but, when they are struggling, we seem to get the bad press." Fleetwood Town Football Club is a professional association football club based in the town of Fleetwood, Lancashire, England. Established in 1997, the current Fleetwood Town F.C. is the third incarnation of the club; it was first formed in 1908. The team compete in League One, the third tier of English football. Their home strip is red shirts with white sleeves and white shorts. The home ground is Highbury Stadium in Fleetwood, and the supporters are affectionately known as the Cod Army. The club won the 2011-12 Football Conference and played in the Football League for the first time in its history in the 2012-13 season. In May 2014, at Wembley, Fleetwood won the promotion play-off to League One, the club's sixth promotion in ten years.